Safety regulations are extensive, designed to ensure the safety of the property and most importantly, the tenants. There are heavy penalties for non-compliance in your duty of care. These cover all gas appliances, flues, meters and associated pipe work and require landlords to arrange an inspection, carried out by a ‘Gas Safe’ registered engineer. Once the engineer is satisfied, a Landlord Gas Safety Certificate will be issued, a copy of which must be held by us and given to the tenant before they move in. This certificate must be renewed annually. It is advisable to arrange the inspection before a tenant is found. This will avoid delaying the start of the tenancy and we can make these arrangements on your behalf. Landlords are also responsible for ensuring that either the operating instructions are shown on the appliance or an instruction booklet is supplied. These regulations set levels of fire resistance for domestic upholstered furniture, furnishings and other products containing upholstery. These include beds, mattresses, head-boards, sofas, nursery furniture, garden furniture which can be used inside a property, cushions, pillows and loose and stretch covers for furniture. Compliant furniture carries the correct safety label. It is a landlord’s responsibility to ensure that the electrical installation and electrical appliances in the property are safe when tenants move in and maintained in a safe condition for the duration of any tenancy, using qualified contractors. All electrical installation work must comply with Part P of the Building Regulations for England and Wales. 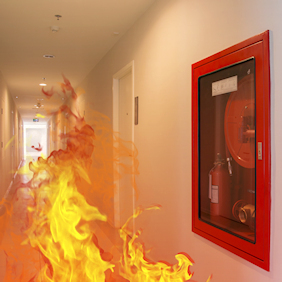 If there is no mains smoke alarm system at the premises, then a battery operated smoke alarm must be installed on each storey within the premises. Carbon monoxide detectors must be installed in any room with a solid fuel appliance. All alarms and detectors must be operational on the start date of the tenancy and maintained throughout the tenancy. The tenant is responsible for changing batteries as necessary during the tenancy. The risk of exposure to Legionnaires’ Disease in the premises must be properly controlled and a risk assessment carried out by the landlord or a competent third party. If a risk is identified, appropriate steps must be taken to remove or minimise the risk and the tenant must be kept informed.